Life Before the Dinosaurs: Helicoprion (Part 2). 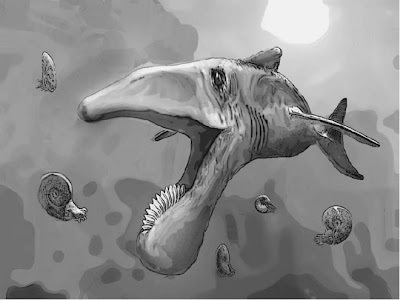 I've already posted Helicoprion before on my blog, as my very first post. But I have learned so much since then that I would like to write about some new information. Helicoprion had a buzzsaw-shaped tooth whorl on its lower jaw, which is what it's famous for. The most up-to-date reconstruction suggests it being a shark-like fish with a long upper jaw and a long lower jaw. At the end of the lower jaw was where the tooth whorl was. Although it is sometimes reconstructed eating ammonites, the absence of broken teeth on most specimens of its tooth whorl suggests that instead of eating ammonites, it fed on animals such as squid, fish, and other animals without shells. Although most specimens of Helicoprion's tooth whorl are about 10 inches in diameter, one specimen has a diameter of about 2 feet, suggesting that this odd shark-like cartilaginous fish might have grown more than 32 feet long, which makes Helicoprion one of the largest cartilaginous fish of all time. Only Megaladon, which didn't appear until the Tertiary period, was larger. Fossils of Helicoprion have been found all over the world, as far apart as Australia and North America. The first remains were found in Russia and were named Helicoprion bessonovi. Other fossils of Helicoprion bessonovi have been found in China, which is not surprising to me because they were nearby. At the time that Helicoprion lived, all the continents were together, which probably explains why it has been found in so many places. 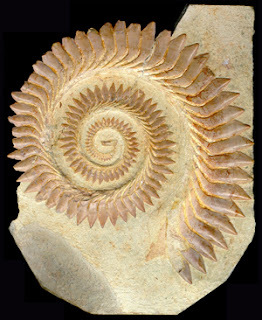 In the United States, fossils of Helicoprion are found mostly in the western states, near where fossils of the related Edestus have been found. Helicoprion lived from the Carboniferous to the Triassic, which is quite a long time for a single genus to be around.